Escape and Suspense! : Best or Worst? In Suspense's "Four Hours to Kill," Robert Taylor plays a newspaper man who falls in love while hunting down the woman who can put him away for murder. As the episode opens, Ted Pomeroy explains about the competition between himself and his successful younger brother, Walter. Then he describes what happened the night he went to Walter in the hopes of obtaining a business loan. Walter was drunk and as nasty and competitive as ever. Not only did he refuse to help, but he berated Ted for being a failure and started a fight. Ted took a swing at Walter for being a jerk...but when Walter didn't get up, Ted discovered that he had accidentally killed his brother. Ted's other realization was that his arrival had interrupted a phone call. Walter had put down the phone to answer the door, and the woman on the other end of the line heard everything...but she doesn't realize that Walter is dead yet. Ted needs to find her before she discovers the truth and tells the police what she knows. Then, he plans to kill her to protect himself. Can he track her down with only the few clues that he has? "Four Hours to Kill" was directed by Norman MacDonnell and produced by William Spier. Robert Taylor starred. Joseph Kearns played Walter. The name of the female actress is not given. This episode aired on January 12, 1950. This story was originally written by Harold Swanton for Philip Morris Playhouse, which broadcast this episode the previous year on May 13, 1949. The presentation is essentially the same, but there are minor differences, mostly in dialogue. Nevertheless, the PMP version seems the better one of the two. William Spier was the producer for that version as well. Howard Duff starred but also appearing were Wally Maher and Cathy Lewis. In "Murder Through the Looking Glass," Gregory Peck stars as a man who does not remember the murder he is accused of having committed. This episode was based on the 1943 novel Murder Through the Looking Glass by accomplished mystery writer Craig Rice, whose real name was Georgiana Ann Randolph Craig. Known for her surrealistic approach to story-telling, her works were published under a number of pseudonyms. For Murder Through the Looking Glass, the pseudonym Michael Venning was used. Normally, here at Escape and Suspense!, we always read the original work before posting a radio adaptation, unless that item is particularly hard to get. Such is the case with this novel. Surviving copies of Murder Through the Looking Glass are very expensive, and they are not readily available through interlibrary loan. The other issue with this episode is that the novel was adapted for radio by pulp fiction writer Ken Crossen. If his adaptation of this book is anything like his adaptation of Graham Greene's Confidential Agent, for Escape, then he may have completely changed the story to suit his style. Without a copy of the original work to go by, we really don't know. "Murder through the Looking Glass" was produced and directed by Anton M. Leader. Gregory Peck starred. The name of the actress playing Rosalie isn't given. Joseph Kearns played the doctor. This episode aired on on March 17, 1949. Escape's "The Fugitive" was adapted from the short story by Vincent Starrett (1886-1974), which is available in the book The Quick and the Dead (1965). Escape's version is similar to Starrett's story but not exactly the same. It was also expanded with additional characters and lots of dialogue. The episode opens in southern France in the town of Saint-Just. A master thief by the name of Duplessis has escaped from Tarantelle prison and attempts to make his way to Spain. He knows he is being tracked by Lemieux, a clever and cunning policeman. Duplessis finds Marie, the girl he is devoted to, and she takes him to Paul Despard for help. Marie then leaves and Duplessis tries to retrieve the bag of jewels that he left with Despard befote going to prison. Despard claims to be his friend, but Duplessis realizes that his friend has signaled for the police. Duplessis runs off again, with the police in pursuit. Can he trust Marie? Will he be able to make it to Spain? "The Fugitive' was adapted for radio by Les Crutchfield and produced/directed by Norman MacDonnell . Featured in the cast were Luis Van Rooten, Ben Wright, Gloria Blondell, Berry Kroeger, Wilms Herbert, and John Dehner. This episode aired on August 15, 1948. So, here is "A Matter of Conscience." Why haven't I posted this one sooner? The sound quality. I haven't been able to come up with a recording of this episode that is pleasant to listen to, and it is difficult to appreciate a radio broadcast when you can't hear it properly. The news first came while he was drinking tea with his friend Captain Logan. An assistant arrived to inform them that three English college boys from Captain Logan's ship had desecrated one of the statues at the temple. They also ran off with two of the young temple dancers. Were they able to find a solution that settled everyone down? "A Matter of Conscience" was written by Antony Ellis and directed by Norman MacDonnell. Parley Baer starred. Also appearing were Ben Wright, Harry Bartell, Jack Kruschen, John Dehner, Don Diamond, and Terry Kilburn. This episode aired on January 18, 1953. We're still making our way down our list of remaining Escape episodes...so, with nine left to go, here is "Clear for Action." William Conrad stars as a nineteenth century American Navy captain who is sent to the Caribbean to guard American merchant ships from a French sloop of war. In the course of doing this, he gets in a scuffle with a British ship, makes friends with the crew of of a merchant ship that has been attacked, and then gets in a battle with the French ship. There is a love interest, too. There isn't much of a story here, but the performances are fun, the dialogue is entertaining, and as always, Escape does a convincing job of recreating the experience of being on board a ship. Does it provide an escape? Yes. "Clear for Action" was written and directed by Antony Ellis. William Conrad starred. Featured in the cast were Ben Wright, John Dehner, John Stephenson, Tudor Owen, Vivi Janiss, Richard Peel, and Dave Young. This episode aired on June 14, 1953. Escape's "A Source of Irritation" was adapted from a story by Stacy Aumonier, which was first published in the January 1918 issue of Century Magazine and later published in The World's One Hundred Best Short Stories, 1927. It is currently available online as a Gaslight e-text. The original story is a WWI tale, but Escape changed the setting to WWII. As the episode opens, Sam Gates is working on his farm tending his turnips and beets when he is irritated by the daily arrival of his niece, Aggie. She asks him if there is any "noos." Of course, there never is, but she asks him for "noos" twice a day--everyday. Sam has little interest in anything outside the limits of the farm. After she leaves, Sam is further annoyed by a Nazi airplane that suddenly appears and makes an emergency landing in his field of turnips. When he yells at the pilot to leave, the man seems to recognize Sam. He then forces him into his airplane and takes off into the sky. Then, Sam finds himself in Germany, where the Nazi officers are amazed by his resemblance to a notorious spy named Paul Jaubert. They devise a plan to let the British find Sam's dead body in the battlefield, where they will surely think he is Jaubert! Meanwhile, the real spy will be able to continue his operations. "A Source of Irritation" was adapted for radio by television writer Meyer Dolinsky and produced/directed by Antony Ellis. Ben Wright starred as Sam Gates. Featured in the cast were Hy Averback, Paul Frees, Jack Kruschen, Charlie Lung, Betty Harford, John Dodsworth, Alec Harford, Richard Peel, and Ramsay Hill. This episode aired on July 5, 1953. Map showing the location of the village of Haversham in the county of Buckinghamshire, the area where this story takes place, is from Wikipedia. Escape's "The Man From Tomorrow" tells the story of a former fighter pilot who trains to develop extraordinary sensory powers. This is a weak episode of Escape, (and kind of a downer), but technically it was well done. This episode was written by screenwriter Irving Reis, and it aired not long after his death in 1953. Suspense recycled this script in 1957, and in the intro, William N. Robson mentions that this radio play was the last one written by Reis. As the episode opens, Dix reads a job announcement in the newspaper requesting an ex-fighter pilot to participate in a series of tests as part of a "daring experiment." When he arrives to apply for the position, there are sixty other unemployed ex-pilots already waiting. The applicants wait over two hours, and then they are subjected to a harrowing screening process that involves machine guns and a simulated plane crash. Afterwards, the traumatized veterans are abruptly given a token monetary compensation for the inconvenience and told to leave. Dix is the only one they want to talk to. The doctors in charge of the experiment then explain to Dix that he will undergo tests over three years to develop and expand his sense of sound, hearing, taste, touch, etc. The purpose is to develop his powers of awareness beyond those of normal perceptions. For this he will be compensated $20,000 and signed for five more years at that salary. He also has to give up everything else in his life. Dix agrees to take the job. "The Man from Tomorrow" was written by Irving Reis and produced/directed by Antony Ellis. Lawrence Dobkin starred as Dix. Also appearing were Vivi Janiss, Edgar Barrier, Curt Martell, Jack Carroll, and Barney Phillips. This episode aired on August 23, 1953. Suspense later recycled this episode with Frank Lovejoy and his wife, Joan Banks, in the lead roles. This episode aired on September 1, 1957. William N. Robson produced and directed. Also appearing were Norm Alden, John Hoyt, and Peter Leeds. Escape's "The Fortune of Vargas" was adapted from the 1937 novel The Third Hour by Geoffrey Household. The story, being too long for a half-hour show, was considerably trimmed and altered for radio. The episode opens in Panama City, where Toby Manning is arguing with his boss about quitting his job as a mining machinery salesman in Latin America. Toby is discouraged about his life, but three days later, he is confronted with a new opportunity. While out for a drink, he strikes up a conversation with the bartendar, Manuel Vargas. Toby asks Vargas if he would like to help him start a revolution, but Vargas declines because he has already done that. Years ago, he fought alongside General Lara in a revolution...and that is how he knows about a fortune in gold hidden in the Mexican mountains. Manuel decides that Toby is the right man to help him with the difficult task of retrieving the fortune. If Manuel enters Mexico, he will be executed. That is why he needs a partner. Toby agrees to retrieve the gold and split the half million dollars. Will their plan succeed? Or, will Toby be back selling mining equipment in a few weeks? "The Fortune of Vargas" was adapted for radio by Les Crutchfield and produced/directed by Gordon T. Hughes. Victor Mature starred as Toby Manning. William Conrad also appeared. The names of the other actors aren't given. This episode aired on September 21, 1949. Escape's "Beau Geste" was adapted from the classic adventure novel of the same name by Percival Christopher Wren, which was first published in 1924. Beau Geste is a long and complicated novel to shorten for a half hour radio program and Escape's adaptation reflects that difficulty. Beau Gestehas been adapted for the screen several times and has also been parodied in many ways. The full text of the novel is available online at Google Books. The opening scene of the Escape's version is essentially the same as it is in the the 1926 silent film starring Ronald Colman and the 1939 remake starring Gary Cooper. A squadron of French Legionnaires arrives at isolated Fort Zinderneuf in the Saharan desert. At first there is no response from inside the lonely fort, but then, suddenly, shots are fired! When the squadron comes closer, they find that the soldiers who appear to be protecting the fort...are dead. When they send a man over the wall of the fort...he doesn't come back. Finally, the commandant and his sergeant climb the wall and search the eerie fort themselves. Inside, they find two more dead bodies. One is a young man, and the other was the commandant of the fort. They also find a signed confession by Beau Geste stating that he was the one who stole the famous sapphire known as the "Blue Water". Before they can make sense of what they have found, they discover that someone has set the fort ablaze. What is the mystery of Fort Zinderneuf? "Beau Geste" was adapted for radio by Les Crutchfield and produced/directed by Norman MacDonnell. Featured in the cast were Berry Kroeger, Wilms Herbert, Jay Novello, Ben Wright, Ramsay Hill, Lillian Buyeff', and Peggy Webber. This episode aired on June 6, 1948. This is an episode of HQ Escape from Tennesee Bill's OTR. It is a large file, so it may take longer to download. Below is the opening scene from the 1929 silent film Beau Geste. Escape's "He Who Rides the Tiger" is based on the 1948 novel The Nightwalkers by James Norman, which is set in post-World War II China. The title of The Nightwalkers refers to foreigners who were not in China during the war, and who do not understand the subsequent changes. Their lack of memories of wartime events prevent them from understanding the consciousness of new China. Escape's adaptation includes a number changes to the story, some for the better. As the episode opens, David Armour wakes from a fevered dream of disconnected images. He is in a mission hospital, but he doesn't remember how he got there. He explains to the doctor that he is an archaeologist, and that he is in China to help protect national treasures from the advancing Japanese armies. The doctor informs him that he arrived at their hospital two months ago sick with fever and wearing a Japanese uniform. The last thing David remembers is having lunch...in 1941. Somehow, he has lost his memories of the last eight years. David also has a visitor named Quinto, who is very interested in his problems and his missing years. Quinto explains that there is no record of David during the war years. What was he doing? Working for the Japanese? David doesn't believe it. So, what does Quinto want from David? Four missing T'ang bronzes. They are national treasures but they were hidden away during the war. Now, they appear to be lost. Quinto believes that David knows where those bronze treasures are. Does he? "He Who Rides the Tiger" was adapted for radio by Les Crutchfield and Norman MacDonnell produced and directed. William Conrad starred as David Armour. Berry Kroegerplayed Gimiendo Quinto. Also appearing were Maria Palmer, Jack Kruschen, Ben Wright, and Edgar Barrier. This episode aired on March 12, 1949. This is a high quality episode of Escape. It is a large file, so it may take longer to download. Escape's "The Man with the Steel Teeth" was written by radio actor John Dehner, but there doesn't appear to be a recording of this episode that is of decent audio quality. Fortunately, Suspense recycled this story in 1955 with Dehner in the lead role, and there is a good quality recording of that broadcast. As the episode opens, newspaper correspondent Arthur Henderson Luttrell is picked up at the Bolshoi Theatre in Moscow, arrested by the Soviet secret police, and taken to Lubyanka Prison. He is asked to confess to a number of outrageous crimes, including espionage. Although they beat him and try to wear him down psychologically, he refuses to confess. "The Man with Steel Teeth" was written by John Dehner and produced/directed by Antony Ellis. Harry Bartell starred. Also appearing were Jack Kruschen, Charlotte Lawrence, Steve Roberts and Paul Dubov. This episode aired on March 15, 1953. Suspense presented this story on February 17, 1955. Antony Ellis produced/directed. John Dehner starred. Also appearing were Edgar Barrier, Robert Boone, Jack Kruschen, and Maria Palmer. Escape's "This Side of Nowhere" tells the story of a pilot who accepts an offer to fly a dangerous woman across the border to Mexico. It isn't one of Escape's best, but it isn't one of the worst. It lands just somewhere in the middle..and that seems to fit the mood and ending of this episode. The story opens in Willing, Kansas, as a pilot named Gannett lands his plane in an empty field. He has come to town to sell short rides to the locals but soon gets an offer from Phyllis, a hotel guest, to make a trip to Wichita. Phyllis doesn't want to wait around for the bus. Gannett accepts her offer, but when they are on en route to Wichita, Phyllis then asks him to take her to Mexico. Gannett refuses, but she uses a gun to change his mind. She needs to get to Torreon, and Phyllis is determined to make Gannet take her there. He warns her that they will be traveling over some rough country, but she isn't concerned. As it turns out, she should have listened to Gannett's warning. While flying over that rough country, their plane runs into trouble and they land...somewhere in Coahuila, Mexico. "This Side of Nowhere" was written by Antony Ellis and directed by Norman MacDonnell. William Conrad starred as Gannett and Virginia Gregg as Phyllis. Don Diamond played Esteban. Also appearing were Lou Krugman and Ralph Moody. This episode aired on December 3, 1950. Escape's "Elementals" was based on the short story by American author Stephen Vincent Benet, which was first published in Cosmpolitan magazine in 1925, and is currently available online through Google Books. This is a strange and depressing episode that makes more sense after reading the short story. "Elementals" is the story of a wealthy man, Mr. John Slake, who does not believe that love is more powerful than the "three prime movers" in the human soul--fear, hunger and hate. While having dinner with his scholarly friend, Sherwood Latimer, he discusses this belief. Slake points to the results of a cruel test done by the Renaissance Italian Prince Guiccardini in the sixteenth century. Guiccardini had tried to prove that love could not endure over hunger by performing an experiment in which two lovers went without food for ten days. At the end of the test, if their love endured over their pain, they would receive wealth and title. However, when the ten days ended, they died in a fight over a crust of bread. Slake offers Latimer the chance to undergo the same test for seven days with a prize of $10,000 if he and his fiance succeed. Latimer and his fiance do survive the test, and Slake accepts defeat in disgust. In Escape's version, two men argue about the power of love, after seeing a play, and offer the experiment to their cab driver. Not being able to resist the money, the cab driver and his fiance, Cathy, agree to undergo seven days of starvation to prove the power of their love. "Elementals" was originally adapted for radio by Meyer Dolinsky and produced/directed by Antony Ellis. Tony Barrett starred as Latimer, William Conrad as John Slake, and Georgia Ellis as Catherine Vane. Also appearing were Ben Wright and Byron Kane. This episode aired on October 11, 1953. Suspense presented "Elementals" on June 12, 1960. Their version is much closer to the orginal story and the better of the two. (This episode also has a perky Fritos corn chips commercial right after the starvation scene --which helps break the tension.) Phil Meader played Latimer, Santos Ortega played Slake and Ellen MacCrea played Cathy. Paul Roberts produced/directed. Escape's "Journey Into Fear" was adapted from the 1940 novel by Eric Ambler, which tells of a British engineer attempting to flee German enemy agents who want to kill him. The novel is too long for a half hour radio show, so parts of the story were cut. In the book, the main character becomes involved in an ongoing flirtation with a beautiful but scheming cabaret dancer named Josette. She and her petulant husband/business partner, Jose, take up a good portion of the novel, but aren't included in Escape's version. Other changes were made to the story as well. In 1943, Journey Into Fear was made into a film by Orson Welles which starred Joseph Cotton. Edgar Barrier appeared in both the film and Escape's 1950 adaptation. The episode opens in Instanbul as Graham enters his hotel room. Suddenly, someone shoots at him! The intruder crawls out of the window and Graham is relieved to discover that his only injury is to his hand. He calls his business associate, Kopeiken, and explains what has happened. Kopeiken takes him to Colonel Haki of the Turkish secret police. Graham thinks that it is all of lot of fuss over a burglar, but Haki warns him that the man was not just a thief. He was sent there to murder him! Colonel Haki explains to Graham that his work in Instanbul is important to Turkish military efforts and there are enemy agents who want to see that work stopped or delayed. The only way to leave Instanbul without danger is to sail on the cargo ship Sestri Levante. Graham agrees to the plan, but he soon realizes that the boat isn't as safe as Haki said it was. "Journey Into Fear" was adapted for Escape by Antony Ellis. Norman MacDonnell produced and directed. Ben Wright starred as Graham. Also appearing were Wilms Herbert, Edgar Barrier, Rolfe Sedan, Ann Morrison, Jack Kruschen, Lou Krugman, and Shimen Ruskin. This episode aired on November 19, 1950. Escape's "Confidential Agent" was adapted from the 1939 novel The Confidential Agent: An Entertainment by Graham Greene. In this instance, they chose not to adapt the book as it was written, and so changed the story and characters that there is little resemblance between the radio version and the source work. The question is...why? The novel (which Greene wrote with the help of benzedrine) is the sort of desperate, gritty story that Escape normally didn't shy away from. Was it because Greene's novel about a middle-aged, traumatized, war-weary, beaten-down agent who is relentlessly pursued by enemies and police--was just too depressing? Probably. Escape, instead, chose to punch up the excitement by making the agent younger, the story less perilous, and the romance standardized. Escape's adaptation was written by a man named Kendall Foster Crossen (1910-1981). Crossen was a prolific radio script writer, pulp fiction writer and an editor of Detective Fiction Weekly. He wrote more than twenty novels featuring Milo March, an insurance investigator. So, Escape's "Confidential Agent" is really a radio play by Kendall Foster Crossen within the basic framework of Greene's novel. Confidential Agent was also made into a movie in 1945 by Warner Brothers. You can find a review of both the novel and the movie over at Mysteryfile.com. As the episode opens, a boat has just arrived in Dover harbor. David, a secret government agent, has come to England on a mission to obtain industrial diamonds. He is suspicious of everyone, but when fellow passenger Rose Cullen offers him a ride from Dover Harbor to London, he accepts. Is she one of them? Will the two of them make it to London without trouble? If they can, will David be successful in his mission? "Confidential Agent" was adapted for radio by Ken Crossen with editorial supervision by John Dunkel. Norman MacDonnell produced and directed. Berry Kroeger starred as D. Also appearing were Edgar Barrier, Constance Cavendish, Herb Butterfield, Parley Baer, Olive Deering, Ben Wright, Wilms Herbert and Alec Harford. This episode aired on April 2, 1949. Escape's "Sire de Maletroit's Door" was based on the short story by Robert Louis Stevenson, which was first published in 1877. The full text is available online at Wikisource. Escape made minor changes to the beginning, and their presentation is nicely done, but "Sire de Maletroit's Door" is not well-suited for an adventure program. The drama consists of courtly dialogue between two people who must decide whether or not to get married. If you like the story, you will appreciate Escape's presentation. If you don't like the story, their version probably won't change your opinion. The episode opens in Paris in 1429 on a dark night. Denis de Beaulieu is running from the soldiers on patrol and ducks into an open door to hide until they pass. When he tries to leave...he can't get out. Denis finds a staircase that leads him to the Sire de Maletroit--who appears to have been waiting for him! He then tries to explain that there must be a misunderstanding, but the Sire de Maletroit doesn't think so. He believes that Denis is the young captain who has been pursuing his niece, Blanche. The Sire de Maletroit makes the situation clear to Denis: marry his niece or die. "Sire de Maletroit's Door" was adapted for radio by Les Crutchfield and produced and directed by William N. Robson. Elliott Lewis played Denis de Beaulieu and Peggy Webber played Blanche. Ramsay Hill played the Sire de Maletroit. This episode aired on August 4, 1947. Escape's "The Notebook" is set in the Dakota Terrritory during the Black Hills Gold Rush in the mid 1870's. It is a tale of two prospectors who are stalked by claim jumpers...and that's about all that happens until the end of the episode. "The Notebook" is a story about pursuit and, ultimately, escape, but does not include a happy ending. It isn't that kind of story. "The Notebook" was transcribed under the direction of Antony Ellis from a story by William J. Radcliff. No short story under this title by that author can be found. So, it is possible that it was scripted for radio from an unpublished work. As the episode opens, two prospectors, Robbie and Mac, have broken camp and are on their way to Deadwood to file their claim. Suddenly, a whiskered man in the distance shoots at them...and it isn't the first time. He wants their claim and he will kill to get it. Mac asks Robbie if he is ready to kill protect their claim, but Robbie can't give him an answer. Is the gold worth it? The whiskered man and his boss seem to think so. They are relentless in their pursuit. "The Notebook" was produced and directed by Antony Ellis. John Dehner starred as Robbie, Joseph Kearns as Mac, and William Conrad as Jack Morris. This episode aired on July 26, 1953. Image of Deadwood, South Dakota from Wikipedia. Escape's "Robert of Huntingdon" is based on the legends of English folk-hero Robin Hood. It has been suggested that if Robin Hood was an actual historical figure, he may have been Robert, Earl of Huntingdon. The first reference to this name in the Robin Hood legend appeared in the stage plays The Downfall of Robert Earl of Huntington and The Death of Robert Earl of Huntington by Anthony Munday, published in 1601. A critical analysis of Escape's adaptation of the Robin Hood legend won't be attempted here. Enjoy this episode for what it is--a romp in the forest with a bunch of talented radio actors who aren't even pretending to have English accents. As the episode opens, the Sheriff of Nottingham offers a reward for the outlaw Robert of Huntingdon, known as Robin Hood. Additional rewards are also offered for the capture of Little John, Will Scarlet, Friar Tuck, and the other known members of his band of followers. In a meeting of noblemen to discuss the situation, Sir Martin of Matlock offers his services to the king and the sheriff. He thinks that stealing from the rich to give to the poor is just an excuse to be outlaws. Sir Martin proposes to stop Robert of Huntingdon and his gang by gathering a force of men to storm into Sherwood forest and exterminate them. When told that his idea isn't feasible, Sir Martin volunteers to go into the forest alone. He will join the outlaws by pretending to be a yeoman who has been wronged by the sheriff. Then, he will gain their confidence and discover where they are hiding. It doesn't take long for Sir Martin to accomplish just that. Everyone accepts him into the gang except Little John. Will Sir Martin's plan cause Robin Hood and his gang to be captured? Or, will Robin Hood become suspicious, too? "Robert of Huntingdon" was adapted for radio by Antony Ellis and produced/directed by Norman MacDonnell. William Conrad played Robin Hood. Also appearing were Lawrence Dobkin, Edgar Barrier, Herb Ellis, Jack Kruschen, Vic Perrin, John Stevenson, Harry Bartell, and Peter Leeds. This episode aired on October 26, 1952. Escape's "S.S. San Pedro" was adapted from the 1931 short novel about a doomed ship by James Gould Cozzens. The novel was loosely based on the true story of the S.S. Vestris in 1928, a preventable disaster that caused significant changes in safety at sea. Cozzens' book doesn't retell the story of the S.S. Vestris, but adapts some of its elements for a story about duty and the puzzling way in which safety measures aren't taken on ship that is clearly in trouble. Escape's episode is adapted from Cozzens' novel but with some further changes. They created a supernatural storyline by expanding the character of Dr. Percival, the corpse-like visitor who first notices the S.S. San Pedro has a problem. This Escape episode is unusual because the two main characters don't escape the dying ship. As for the true identity of Dr. Percival, they leave that up to the listener. As the episode opens, the S.S. San Pedro is about to sail from New York to Argentina. Mr. Bradell, the first officer, is called into the captain's cabin and introduced to Doctor Percival. The captain asks him to take the doctor on a quick tour of the ship before they sail. Doctor Percival takes an interest in the port cabins and then points out that ship is not floating level. Mr. Bradell is disturbed by his guest and happy to say goodbye to him at the end of the tour. However, later one of the passengers claims to have seen Doctor Percival on board..after they set sail. "S.S. San Pedro" was adapted for radio by Les Crutchfield and produced/directed by Norman MacDonnell. Featured in the cast were John Dehner and Charlotte Lawrence. Also appearing were Jeff Corey, Don Diamond, Harry Bartell, Lawrence Dobkin, and Jay Novello. This episode aired on August 22, 1948. Escape's "The Grove of Ashtaroth" was closely adapted from the 1910 short story by John Buchan, First Baron Tweedsmuir (1875-1940). Buchan was a British novelist and politician who is best known for the book The Thirty-Nine Steps. This is an episode that is helped along by reading the original work, which is available online at Feedbooks. The short story was written as one long narrative by a character who doesn't give his name. So, in the radio version, Escape assigned the character the name of the author. "The Grove of Ashtaroth" is not an environmentally-friendly story. It involves destroying an ancient grove of trees to undo the spell it has placed on one man. While this is being done, a goddess begs them to stop. Apparently, they think she is scary and evil, so they don't stop until they have killed and destroyed absolutely every living thing in the grove. As the episode opens, John Buchan and his friend Lawson are exploring Africa when they come to a place so perfect that Lawson decides to settle there. John is surprised by his friend's reaction, but doesn't believe his idea to be a bad one. Can the two of them find a way to release Lawson from the spell he is under? Or, will they destroy a beautiful thing forever? "The Grove of Ashtaroth" was adapted for radio by Les Crutchfield. William N. Robson produced and Norman MacDonnell directed. Paul Frees played John Buchen and William Conrad played Lawson. Also appearing were Kay Brinker, Raymond Lawrence, and Eric Snowden. This episode aired on February 29, 1948. Escape's "Pollack and the Porroh Man" was adapted from the 1895 short story by H.G. Wells. In their adaptation, a few changes were made to the story, but the essentials remain intact. The original work is available online at Horrormasters.com. If Escape had presented the story as written, they may have had a better result. Instead, the episode starts with a retelling by Pollock of the events that have driven him mad...which means that we know from the start that he goes mad. As the episode opens, Pollock is visited in his London flat by Waterhouse, who is surprised to find his old acquaintance in such bad condition. When they travelled in Africa together some months earlier, Pollock was an arrogant and robust man, but now he is a broken and disturbed. Waterhouse is shocked to discover that he is still haunted by the events that occurred on their expedition. Pollock's health problems began when a Porroh man put a curse on him for stealing an idol. Unfortunately, Pollock didn't know that to have the curse removed, he must ask the Porroh man to remove it or kill the Porrah man himself. Instead, he paid someone to kill him. Afterward, when the Porroh man's head was brought to him, Pollock tried to get rid of it...but it wouldn't go. No matter how he tried to dispose of it, the head returned. Now, he tells Waterhouse, the Porrah man's head follows him everywhere. Can he escape it? Escape's "The General Died at Dawn" was adapted from the 1936 novel of the same name by Charles G. Booth. The central character of this story, Gerald O'Hare, was inspired by a man named Morris "Two Gun" Cohen (1887-1970), who was a gun runner for Chinese warlords in the early 1930's and lived an all-around colorful life. In 1936, this story was also released as a film starring Gary Cooper that was nominated for several Academy Awards. Booth cowrote the film's script with Clifford Odets, but the plot differs from that of the novel. Escape tried to present The General Died at Dawn as it was written, but it was condensed down, down, down, to a manageable size. They dropped the dramatic beginning, dumped two of the younger characters, and though they kept the female lead, Mrs. Mallory, she is reduced to a standard love interest. This atmospheric novel is just too long to fit into a half hour radio format. As the episode opens, Gerald O'Hare is an adventurer in Shanghai with nothing to his name. He wants to leave China altogether, so he goes to the office of an old acquaintance named Ramsgate to collect a debt. While he is there, a beautiful woman enters and, mistaking O'Hare for Ramsgate, she asks for his help. It is then, that O'Hare becomes involved in a dangerous undertaking to retrieve the stolen funds of the feared outlaw, General Yang. "The General Died at Dawn" was adapted for radio by Walter Newman with editorial supervision by John Dunkel. Walter Newman produced and directed. William Conrad starred as Gerald O'Hare. Also appearing were Estelle Dodge, Lawrence Dobkin, Ben Wright, John Dehner, Jack Kruschen, and Peter Prouse. This episode aired on April 16, 1949. Escape's "The Footprint" was adapted from a 1908 short story by Gouverneur Morris (1876-1953), a pulp fiction author who was the great grandson of American founding father Gouverneur Morris (1752-1816). Escape probably chose this particular adventure story for radio because it involves a small, menacing snake, and to them, any story about a snake was a good story. That is true of "Poison,""Serenade for a Cobra" and "A Shipment of Mute Fate," but "The Footprint" falls short. The original work, which is available online at Google Books, contains all of the elements for a great Escape episode--but that didn't happen. As the episode opens, a group of men set sail from San Francisco to northern Mexico. They have banded together because of a treasure map they hope will direct them to a hidden fortune in rubies. When they arrive at their destination in the Gulf of California, they find another ship is there as well. They watch as a fat Chinese man with a yellow parasol leaves the ship and then begins to walk across the desert. The men follow his footprints and eventually, catch up to him. The man, Sang-Ti is on his way to the hidden outpost of Chen Chan because it has been prearranged that his life will end there. Sang-Ti warns them to turn back, but the men say they can't. They have come too far. Sang-Ti also warns them not to steal the holy ruby box-- but they do. When the men try to return to their ship, they are pursued across the desert by a strange priest wielding a nasty little snake. "The Footprint" was adapted for radio by Richard Chandlee and produced/directed by Norman MacDonnell. Featured in the cast were William Conrad, Charles Davis, Lou Krugman, Tom Holland, and Ramsay Hill. This episode aired on August 18, 1950. Plunder of the Sun (1949) is a novel by David Dodge about an American in Chile, who smuggles a mysterious package into Peru and then ends up discovering a lost Incan treasure. The episode opens in Valparaiso, Chile, where an antiques dealer named Don Alfredo Berrien and his nurse, Ana Luz Benavides, meet an American named Al Colby. Berrien asks Colby to smuggle a package into Peru. It is a valuable Peruvian artifact that was taken out of the country, and now he wants it smuggled back in. Colby isn't allowed to know what is inside the package, but he agrees to the job anyway. He travels with them on a boat to Peru, but midway through the voyage, Berrien dies. Due to his age, the police assume that it was from natural causes, but when Colby and Anna Luz found Berrien, there had been someone in his room. Was it Jefferson, the American tourist that Berrien was afraid of? When the boat lands in Peru, Colby opens the package and finds a quipa, an Inca message cord and pages of pergamino (parchment). The pages are written in a Spanish translation of the Incan language, Quechua. Supposedly, the pages give the location of a fabulous treasure of Incan gold that was hidden from the Spaniards. Colby travels to Arequipa, to visit Don Ubaldo Naharro, an antiques dealer even more devious than Berrien. Will Colby have the message deciphered and find the treasure? Will he help Anna Luz, the beautiful nurse who wants to buy her way out of indentured servitude? Will Jefferson, the American tourist, get the package from Colby? Or, will Don Ubaldo Naharro find a way to get the package away from both of them? The last part of the book is summarized too quickly, and the final parting of Ana Luz and Colby is very different. If you get the chance, read the book. "Plunder of the Sun" was adapted for radio by John Dunkel. William N. Robson produced and directed. Paul Frees played Al Colby, Gerald Mohr played Jefferson, and Lucille Meredith played Ana Luz. Also appearing were Harry Bartell, Charlie Lung, and Tony Barrett. This episode aired on November 8, 1949. One can only wonder what the people at Suspense were thinking when they presented this episode. "The Morrison Affair" starts out well and keeps us interested until the second half of the episode. Then we realize it is a stupid story. By the end of it, we are certain that it is a stupid story. How does it keep us until the end? Well, it has something to do with the small child who appears to be in constant danger throughout the last half of the show. We can't help but be worried. As the episode opens, Mrs. Morrison is calling upon a divorce attorney. She explains that she needs help, and then she tells him the story of how she met her husband, Dr. Paul Morrison. She is English, and he is American. They met in England and stayed there during the first two years of their marriage. She desperately wanted a child but was unable to have one. On their last day together, before Dr. Morrison left to serve in the war, she tried to convince him that they should adopt a child. Her husband flatly rejected the idea, and Mrs. Morrison was heartbroken. After her husband left, Mrs. Morrison was alone and unhappy in London, but her situation changed the day she took a train to the country. She shared a train compartment with a widowed woman and her several children. The mother seemed overwhelmed by her burden, and Mrs. Morrison felt that the woman was indirectly asking her for relief. So, she stole the woman's baby. After creating a birth record for their son Jaimie, and lying to her husband, Mrs. Morrison felt confident that her plan had worked. Had it? When her husband returned from the war, he had doubts about their "miracle kid." In fact, he seemed to hold grudge against the little guy. "The Morrison Affair' was written for Suspense by Pamela Wilcox. British actress Madeleine Carroll, best known for her role in Alfred Hitchcock's 39 Steps, starred as Mrs. Morrison. Gerald Mohr played Mr. Morrison. This episode aired on September 2, 1948. "Pages from a Diary" is a peculiar episode of Suspense. The story opens in the bedroom of of a farmer named John. His fiance, Janet is looking for something that will help her understand what has happened to him. She opens his diary and starts reading. From there, John's disembodied voice takes over and reads aloud. The narrative takes us into the mind of a man is suffering from mental illness. It is filled with dream-like imagery and confusion. In the background, the music adds to the mood of turmoil. This episode's weakness is that it is one long narrative and relies on the listener to stay intrigued. Not everyone will be. At the very end, we learn something that explains the narrative we just listened to. This episode works because Jim Backus plays the role of John. Why does Jim Backus keep our attention? Who knows, but he does. Perhaps because this isn't the kind of role he typically played. His wife, Henny Backus, played the role of Janet. Normally, the two authored humor books together, but this episode of Suspense shows a different dimension of their talents. "Pages from a Diary" was written for Suspense by Virginia Bolland. This episode aired on August 19, 1962. "In Fear and Trembling" answers the question, "how badly can you screw up your own life?" This is an episode with little suspense, but it does has something to say about jealousy. 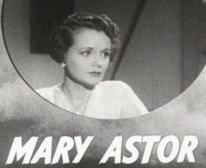 Mary Astor, in her only appearance on Suspense, plays Lucia Durant. Lucia's husband of four years is Gilbert Durant, and they live in his windswept mansion on a cliff..., we don't know exactly where. Her half-sister Beverly came to live with them around the same time that Lucia started to not feel well. Around the time when, "an insidious horror began to gnaw at her happiness..."
Lucia doesn't eat much and is haunted by a terrible dream. Is it a dream, or a premonition? Gil suggests a tonic for her that just happens to have strychnine as one of the ingredients. Beverly complains that Lucia is a hypochondriac with no "pep", but Lucia thinks her sister is out to steal her husband. The only person Lucia seems to trust is the housekeeper. Verna Felton plays Mrs. Benson the housekeeper. You may not be familiar with the name Verna Felton, but her voice is recognizable to people of all ages as the fairy godmother in Disney's Cinderella. In this role, she isn't as helpful. When Mrs. Durant goes missing, Mrs. Benson calls the police and blames Gil and Beverly for Lucia's disappearance based on what she heard while eavesdropping. This story borders on being funny because of Lucia's character. The story concludes into a "big lesson" that comes down on Lucia's head. Although she has suspected her sister and her husband of being involved, she finds out her suspicions were wrong. Even better, it had never occurred to Gil and Beverly that they might be in love until Lucia mentions it to them. Then, they realize she might be right. In her final act of stupidity, Lucia makes it possible for them to be together. This episode was written by J. Donald Wilson and aired on February 16, 1943. The names of the supporting cast aren't given on the recording. This is an episode from the science fiction series X Minus One, which ran on NBC from 1955-1958. It is the story of a doll named Toto and a little girl named Cindy. The story is set in Washington D.C. where Cindy's father works as a government official at the Pentagon. On an afternoon shopping trip, Cindy and her mother discover Mr. Perigi's Toy Shop, and Cindy's mother is talked into taking home a doll named Toto. He walks, talks, laughs maniacally, and performs a little song about dolls taking over the earth--but none of this worries Cindy and her mom. They get Toto home and right away there is a showdown between the family dog and the doll. One of my issues with this episode is the name of the family dog, "Mr Blister". Am I hearing that right? The name is distracting, but the family dog doesn't last too long with this doll in the house. This episode was broadcast on June 5, 1955 and it is entertaining and memorable despite its essentially silly plot and Toto's laughing. Really, Toto does a lot of maniacal laughing in this episode. "Perigi's Wonderful Dolls" had previously been presented on the series Dimension X on August 4, 1950. The story is the same but there are some differences in the script. I prefer the X-Minus One version, but the fight scene between the doll and the dog is better in the earlier version. Dimension X's Toto seems scarier at first, but his tinny voice loses any fright value long before the episode ends. Ask me to single out the worst episode of Suspense and my mind immediately jumps to the episode "The Doll". Is it the worst - or is it one of the best ever? I can't tell anymore. It is one of my all time favorites. Unintentionally funny and surreal, "The Doll" can't be pinned down into any one category. Suspense began their fifteenth year on the air with this episode on October 23, 1956. "The Doll" stars Patty McCormack of the movie The Bad Seed and her performance is fine but everything else about this episode is out of whack. The sappy, lilting music interferes by making it impossible to take anything that happens too seriously. Even worse are the sound effects for the beating heart of the doll which are SO LOUD and distracting that the actors have to strain to be heard over it. A seven year old girl named Val gets a doll from her new stepmother for a birthday present. The doll has "a gadget". You wind it up and its heart beats. Val names the doll after her dead mother (who died of a heart condition). Val becomes convinced that the doll will die too if she doesn't keep it constantly wound up. Val's father and stepmother argue about the doll because it may have been a bad idea and decide to burn it in the incinerator after Val goes to bed. Val overhears this and runs away but can't get very far because she has always has to keep the doll wound up and...well, from there it just gets better and better! Suspense broadcast this episode on October 23, 1956.